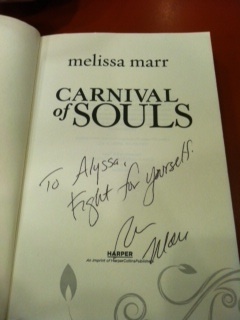 I am always up for a dark tale, and thus far, Melissa Marr has excelled at delivering them. 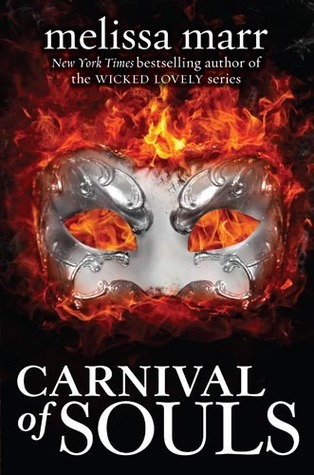 Carnival of Souls was my second book by Melissa Marr and the epic world building, intricate characters and weaving storylines that I loved in Graveminder, were also evident in Carnival of Souls. Mallory is anything but normal; her life isn’t too stable as she is constantly moving from town to town with her adoptive father, Adam. Adam is a witch and is on the run from the daimons because he stole something from them long ago, and their leader would do almost anything to obtain what has been lost to him. It is the constant vigilance of Adam and Mallory that has kept them alive and safe for so many years. Mallory obeys her father’s wishes and doesn’t get too close to anyone, knowing that she won’t be able to spend much time around them anyway. However, things change quickly for Mallory when she meets Kaleb. She is instantly drawn to him and finds him intriguing in a way that she has never felt before. However, she does her best to resist getting to know him because she believes him to be human and knows she can’t risk him by drawing him into her chaotic life. The Carnival of Souls takes place in The City and occurs once in every generation. It consists of fights to the death between daimons, and the prize is a raise in the caste, and a chance to join the ruling class. Kaleb is not at all what he seems to Mallory, he is a lower caste daimon and is one who wears a black mask. The black mask sets him apart and showcases his skills as a fighter and a killer. It are these skills that lead him to be hired to find Mallory for an upper caste daimon. It comes as a surprise to Kaleb when he is drawn to Mallory in a way that he had never imagined, she immediately becomes “pack” to him, and you die to protect those in your pack. Ava is also a daimon in The City. Though unlike Kaleb, she is part of the upper class. Ava chooses to compete in The Carnival of Souls for a different reason than to raise her status. Instead, she fights to win her freedom – the freedom to choose her own future. Female daimons in the upper caste are forced to marry and breed, and Ava would rather die. At first the relationship between Mallory and Kaleb seemed to lean toward the insta-love we find in many paranormal romances. However, Marr made me believe in it in a way I have been unable to in the past. The moment Kaleb described Mallory as pack was the moment I believed fully in their relationship and began to become invested in their reliance on one another as a couple. I also became very interested in Mallory’s growth through the novel, Adam keeps many secrets from her and though she is physically stronger than most females her age, she begins as a very naïve character. She grew fabulously throughout the novel, and by the last paragraph I was metaphorically giving her a high five. I enjoyed the vastly different emotions I felt toward both Mallory and Ava, where Mallory had to grow on me, I loved the strength behind Ava and her utter devotion to fight for herself. I felt angst and sorrow over her decisions because she had no choice but to fight for herself. Melissa Marr again delivered a world that I cannot stop thinking about; I loved the darkness and the blurred lines between good and evil. The caste system, the masks, and their representation throughout The City provided amazing imagery that I had no trouble picturing in my mind. Carnival of Souls was fantastic and delightfully dark. I felt a deep connection to each of the characters and thought the relationships to be intricate and overly exciting. The plot of this novel is fast paced and I devoured it, desperately needing to find out what was going to happen next. I am eagerly anticipating book two in this series, I can’t wait to see who will excel in fighting for what they believe in. Thank you so much for the ARC, Melissa (and HarperCollins), I doubt I was able to express my gratitude and love for this novel in this short post. In a nutshell: you rock! This entry was posted in Reviews, Young-Adult and tagged daimons, death, fantasy, magic, paranormal, shapeshifters, witches. Bookmark the permalink. This is absolutely going on my to be read shelf. Thanks! Oh, and that signature is just really inspiring. I feel like I have no book blogger credibility because I haven’t read any of Marr’s books yet. Most everyone has read the Wicked Lovely books and I need to get on those. The thing I can’t figure out is: Do I want to read the Wicked Lovely books first or this one? One of my quirks is USUALLY that I like to read the books in the order they are written (which I’d LOVE to be able to get over). So I know that I’ll eventually read this one, I am just a teensy bit OCD-like when it comes to that order-thing. GAH I’M making myself sound so WEIRD. This is a great review and I can tell how excited you are about this book and how much you loved it, and I LOVE LOVE LOVE that you included that picture!! How awesome!! EEP! I’ve never read her WL series either but Heidi liked them so I know I will have to pick them up at some point..I read Graveminder and really liked it too so I think you will like it!! I am getting a bit burnt out by reading books in a series SOO far in advance so I have to wait for the next part..honestly don’t tell anyone but sometimes I even forget what happens…oops!